Heat oven to 375°F. Spray bottom and side of 9-inch deep-dish pie plate or 8-inch square (2-quart) glass baking dish with cooking spray. 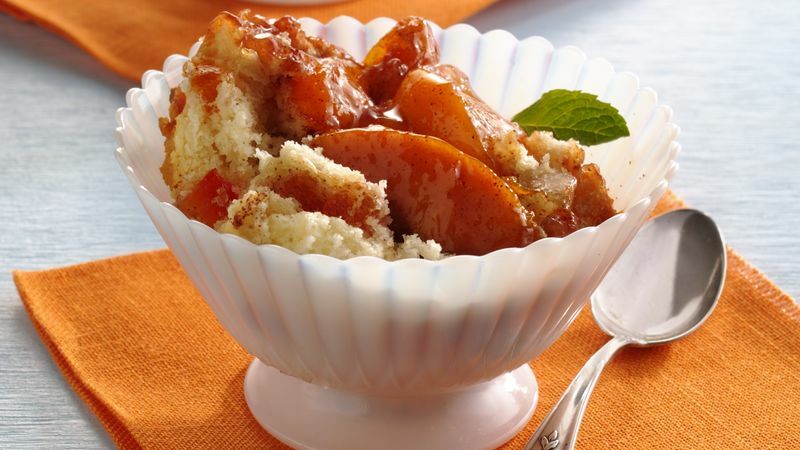 In medium bowl, mix peaches, 1/2 cup sugar, the cornstarch and cinnamon. Spoon into pie plate. In same bowl, stir remaining ingredients until dough forms. Drop dough by 8 spoonfuls onto peach mixture. Bake 35 to 40 minutes or until fruit is bubbly and topping is deep golden brown and thoroughly baked. Spoon into individual serving dishes, peach side up. Serve warm. Serve with whipped topping and a sprinkle of toasted coconut. Dried cherries or cranberries can be substituted for the tropical fruit.